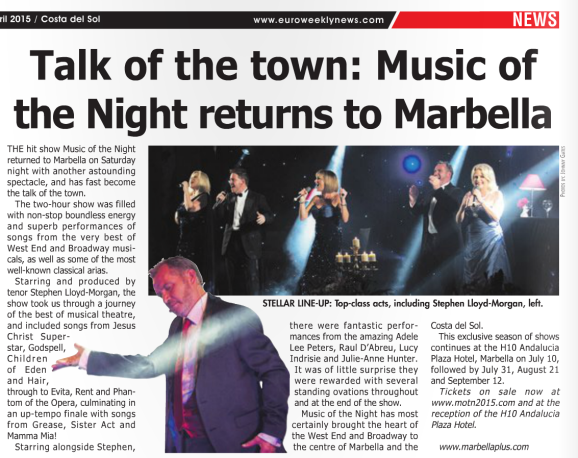 Talk of the Town – ´Music of the Night´ returns to Marbella. | Marbella Marbella – Adelante! 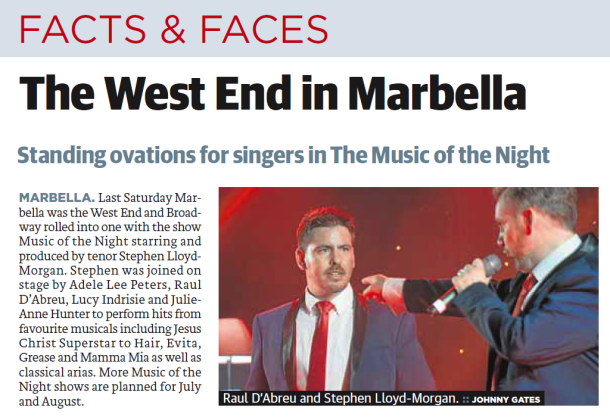 The hit show Music of the Night returned to Marbella on Saturday 14th April with another astounding show, and has fast become the talk of the town. 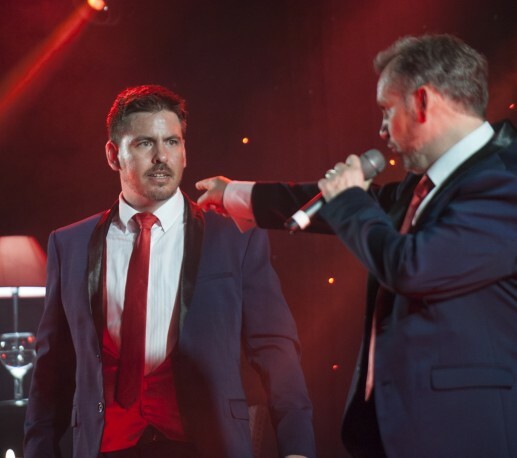 The 2 hour show was literally filled non-stop with boundless energy and superb performances of songs from the very best of West End and Broadway musicals, as well as some of the most well-known classical arias. Starring and produced by Tenor Stephen Lloyd-Morgan, the show took us through a journey of the best of musical theatre, and included songs from Jesus Christ Superstar, Godspell, Children of Eden and Hair, through to Evita, Rent and Phantom of the Opera, culminating in an up-tempo finale with songs from Grease, Sister Act and Mamma Mia! Starring alongside Stephen, there were fantastic performances from the amazing Adele Lee Peters, Raul D´Abreu, Lucy Indrisie and Julie-Anne Hunter. It was of little surprise they were rewarded with several standing ovations throughout and at the end of the show. 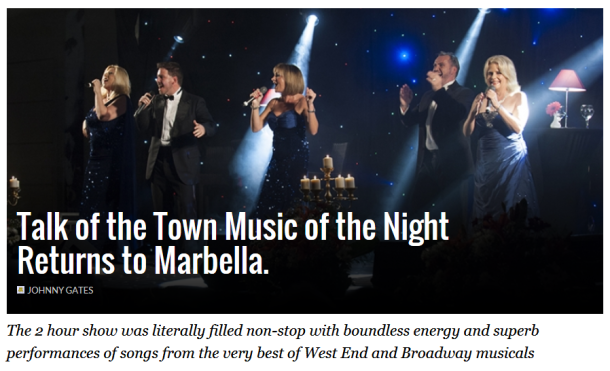 Music of the Night has most certainly brought the heart of the West End and Broadway to the centre of Marbella and the Costa del Sol and we are very fortunate to have this show on our door-steps. 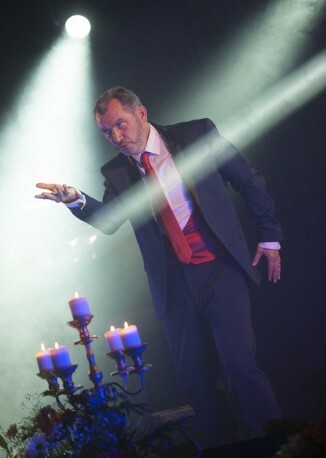 This exclusive season of shows continues at the H10 Andalucia Plaza Hotel, Marbella on 10th July, followed by 31st July, 21st August and 12th September. 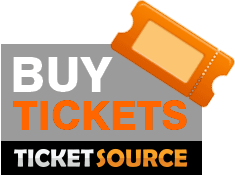 Tickets on sale now at www.motn2015.com and at the reception of the H10 Andalucia Plaza Hotel.